Baking soda has health benefits, for beauty and for household purposes. So far we only know the baking soda as a cooking ingredient for cake batter. In fact, baking soda also has other uses and can be a 'savior' in an emergency. It is interesting to consider for those who like the super low-cost natural remedies. Baking soda or sodium bicarbonate, is a staple in the kitchen that works for baking and cleaning. But there are many benefits of baking soda you did not know. For example, you may not know the benefits of baking soda for stomach acid, cleaning and whiten your teeth, foot soak, bath detox spa style, insect bite medication, etc. 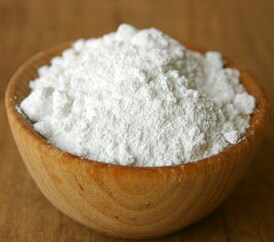 In natural form, baking soda is known as nahcolite, which is part of the natural mineral called natron. Natron, which contains large amounts of sodium bicarbonate, has been used since ancient times. For example, the Egyptians used natron as a soap for cleaning purposes. Then, throughout history shows that many civilizations used forms of baking soda when baking bread and other foods. Baking soda can cool the mouth and a natural mouthwash. Mix 1 teaspoon of baking soda into 100 ml of water. Stir until well blended and used as a mouthwash. It can also eliminate bad breath you know. It is easy, by using it as a powder in the armpits and the effect will neutralize body odor. Baking soda is also excellent for lowering stomach acid. Combine 1/4 teaspoon baking soda with water and drink it. To relieve itching from insect bites, mix 1 teaspoon of baking soda with a little water. Rub in a scratchy and let stand for a few minutes before showering. Baking soda can also cope with the pain caused by sunburn, because it has a cool effect. The trick, wet towel into the mixture of cold water and baking soda, then compresses to the burned skin, irritation, or itching. For a natural way to whiten your your teeth, crush one ripe strawberry and mix it with 1/2 teaspoon baking soda. Spread the mixture onto your teeth and leave it on for five minutes. Then brush your teeth and gargle. This method should be used no more than once a week, due to excessive use potentially damage your tooth enamel. One of the uses of baking soda is to exfoliate or lift dead skin cells. Exfoliate usually done at least once a week to encourage the regeneration of new skin. You can add a tablespoon of baking soda to your regular cleansing milk use or mix baking soda with water and rub it into the skin. Foot felt tired can be overcome by using a warm water bath and the mixture of baking soda. Not only make your feet feel cleaner, baking soda also works to eliminate the odor. After soaking your feet for about half an hour, drain and apply body lotion. You can also use baking soda to clean your nails and cuticles. The trick, pour a little baking soda into the nail and use nail brush to clean the part. Baking soda is also believed to clear acne on the skin. After cleaning your face, mix baking soda with warm water and stir to form a thick batter. Apply on the face or acne prone skin, leave on for 5-10 minutes, then rinse thoroughly. Baking soda is a natural product that can cleaning dirt. Sprinkle a little baking soda into the toilet, then brush evenly. Thus, the bathroom, be clean and you are more efficient because it does not have to buy toilet cleaner. Keep baking soda in bottles or sealed containers, then put it in the kitchen. This method is useful for extinguish a fire, if there is a light fire when you are cooking, pour it into the source of fire. While making the room a mess, but you will be saved from disaster. You can clean a stubborn stain on clothes with baking soda. Combine 1/4 cup baking soda and detergent into the washing machine. Baking soda can remove the dirt that is difficult to clean. Baking soda for eliminating bacteria that glue on the vegetables and fruits that are newly purchased. Fill water into a large bowl or pan to wash fruits and vegetables. Add two tablespoons of baking soda, then fruits and vegetables can be cleaner than using plain water. Maybe you are annoyed that home sewers clogged with garbage or other debris. Sprinkle one cup of baking soda and a large bottle of hot water into the drain. Besides economical, this method can reduce the blockages that occur in the channel. Every house must have some dust cleaning cloth, like a napkin or something. Dust is sometimes difficult to be removed by ordinary soap. You can soak a dirty washcloth in water that has been mixed with baking soda, leave a few minutes. Then the dirt will be lifted by itself. Difficulty washing your microwave because the glue dried food in it? Take advantage of baking soda for easy removal of food debris that stick. Put baking soda into a container of water and heat in the microwave for 1 to 2 minutes. In this way, the crust is contained in the microwave will be easier to clean. Put baking soda in an open container in the refrigerator. Baking soda can maintain the freshness of foods or drinks to avoid contamination with unpleasant smell. The smell could have come from raw foods such as fish and meat or food that has been long. In addition, you can also give a bit of baking soda in the trash and the carpet around the house. Let stand for 10 to 15 minutes to remove the smell not only the carpet but also the entire room.